After visiting Italy so much this summer, I've been inspired by their cooking (and their wine!). 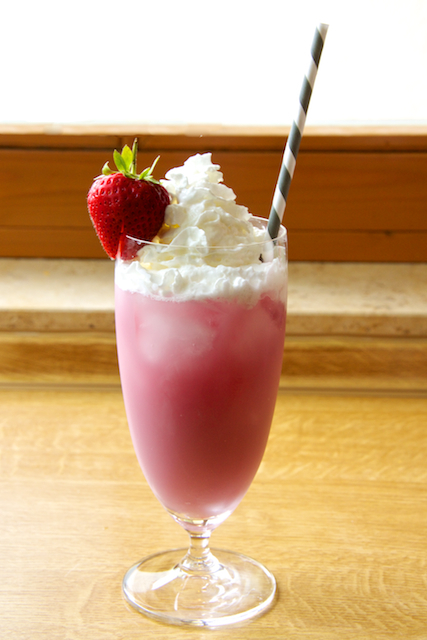 One thing I've always wanted to make at home is Italian cream sodas. I'm not a soda drinker at all, so this may seem a little weird. But the cream sodas always look so pretty and refreshing. I couldn't wait to try it out myself. The basic recipe is so simple, even the Hubs could do it! All you need is a bit of sparkling water (or club soda, but I found I like the water best. Club soda has a bitter aftertaste), your favorite flavored syrups, and a splash of cream. 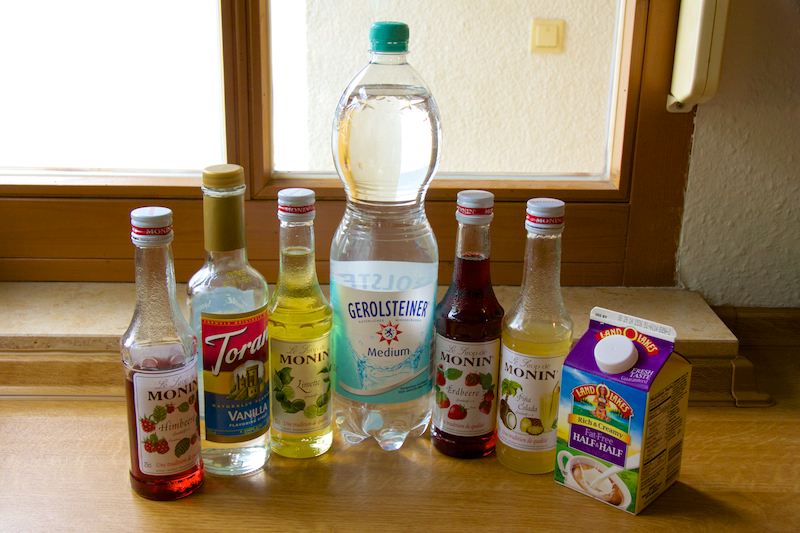 There are all kinds of syrups to choose from, but two popular brands are Monin and Torani. The cool thing about these syrups is that you can pick from a huge variety of flavors. And, you can mix flavors to make your own yummy combinations! I've included a list at the bottom of some possible flavor combos to help inspire you. I stuck with fruity flavors because that's what I tend to like. But I'd love to hear from you about other combos, maybe involving chocolate and caramel??? I began by adding the syrup to an empty glass. I often see people adding ice first, but I think the soda mixes better if you add the ice after. Whatever floats your boat, my friends! The amount of syrup really depends on you, your taste, and the sweetness level of the syrup. 3 tablespoons is a good average. For example, The Kid's pina colada mix was much sweeter than expected, so we added a little less. 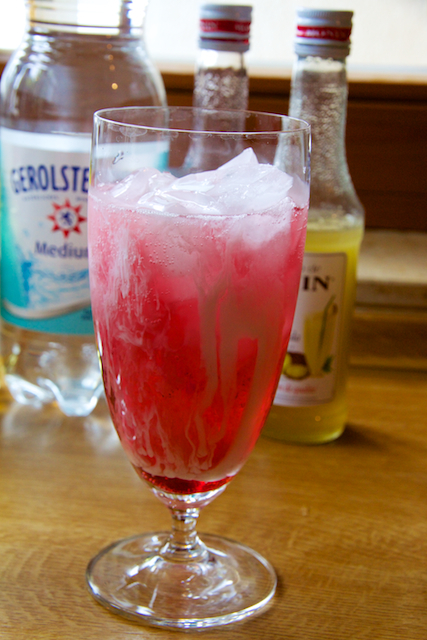 Using raspberry alone was a bit tart, so we added a splash more. You got that so far? Good. 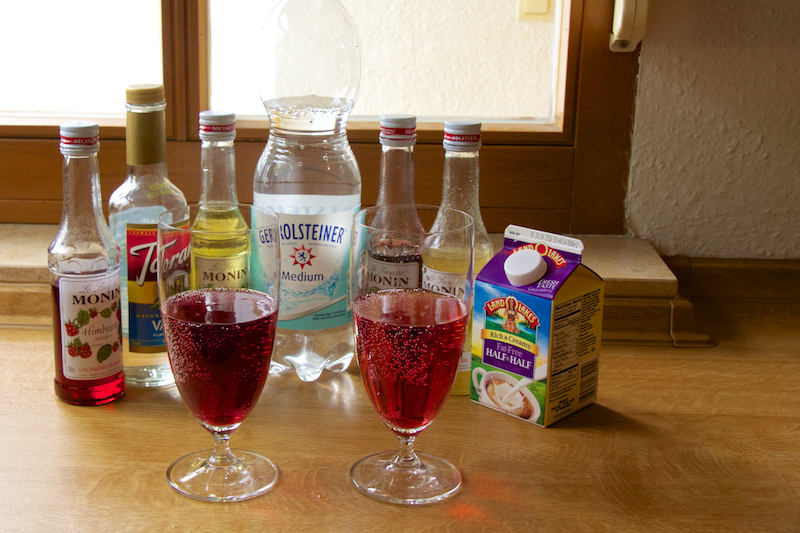 Next, add your sparkling water, around ¾ cup. The syrup and water will blend a little naturally, but give it a little stir too before adding your ice. Add enough ice to fill the cup, but leave a small gap at the top to add 1 tablespoon of cream. A word about cream: I made an interesting discovery with my pal Michelle one day as I made these (for like the 10th time, they're so good!). Never, ever use the fat free junk you see in my pic. I used this because it's what the Hubs brought me home, instead of the full fat organic kind I normally like. Boys never get the right stuff at the grocery store, do they? Anyway. Not only is organic better, but the full fat is pretty important. The no fat does ok for some flavor combinations, but if you add it to anything acidic… the cream breaks. You know, that chunky ooky grossness that happens when you spoil your cream? Yeah, not pleasant. So the moral of the story is, always buy the half&half with the fat! Gently stir in your fatty cream (I use my straw, no sense dirtying up another utensil), then top with whipped cream if you want. 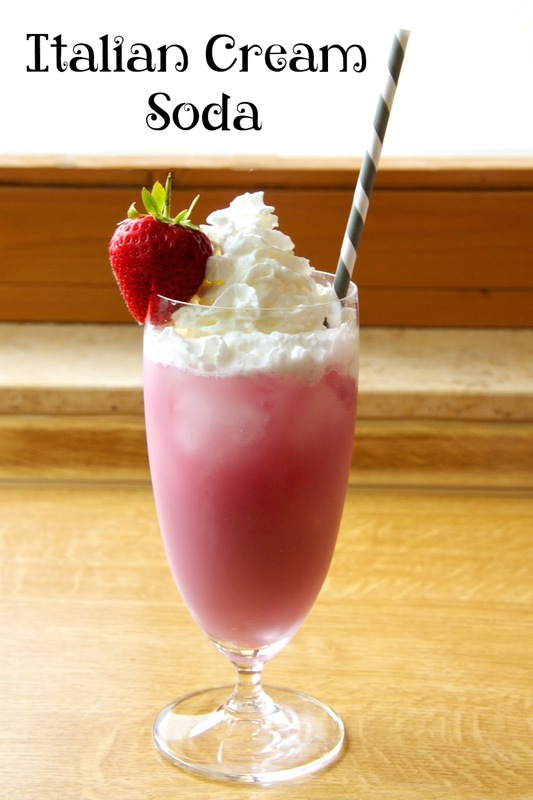 Note: You should always want to top your Italian cream soda with whipped cream. Add a cherry, strawberry, or other garnish, and you're done! I'm curious to hear what flavor combinations you come up with, so be sure to comment below peeps. I've included some possibilities to get your brain juices flowing. And, of course, the standard recipe is below. 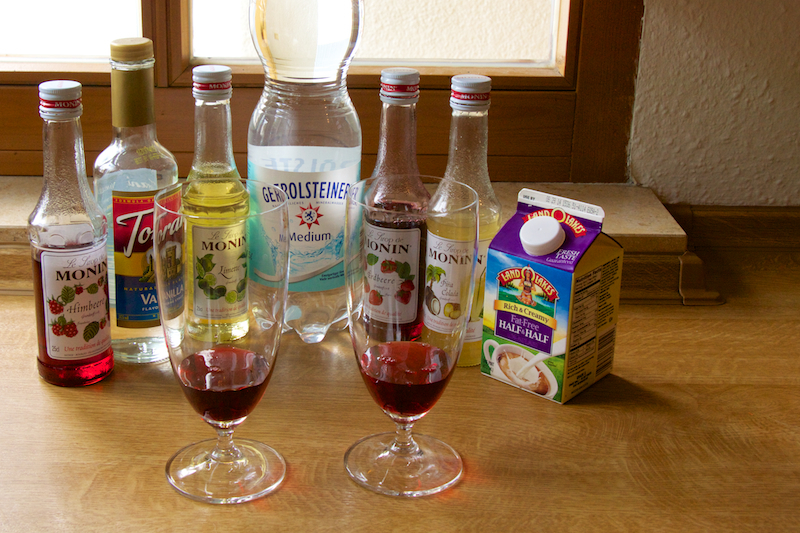 Add your choice of syrups to the bottom of a glass. Stir in the sparkling mineral water. Add ice to glass, stopping one inch below rim. Stir in the cream. Top with whipped cream and garnish with fresh fruit, if desired.